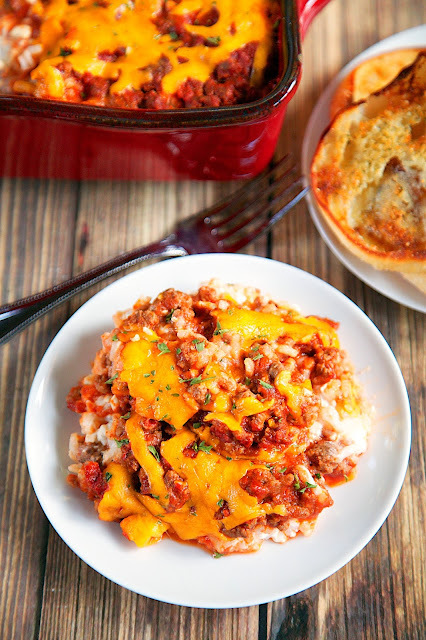 Sour Cream Beef and Rice Casserole - Ready in under 30 minutes!! 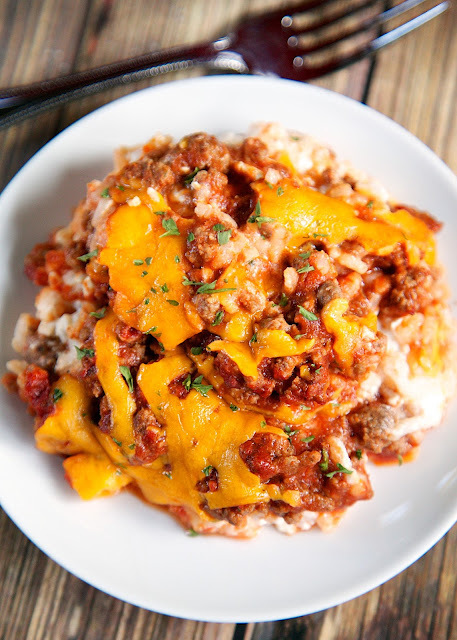 Rice, sour cream, cottage cheese topped with a quick homemade meat sauce and cheddar cheese. Super quick weeknight meal! Serve with some green beans and crusty bread. I adapted this recipe from one of our old favorites - Sour Cream Noodle Bake. The original recipe uses noodles. I've been on a rice casserole kick lately, so I decided to swap out the noodles for rice. The result was a fantastic quick weeknight meal! This Sour Cream Beef and Rice Casserole has quickly become one of our favorites. I love all the flavors in this dish! I also love how easy it is to make. I usually have browned hamburger meat in my freezer, so this literally takes about 5 minutes to throw together. We serve this with some green beans and a crusty roll for a delicious weeknight meal! Bring water to a boil in a medium sauce pan. Stir in instant white rice, cover and remove from heat. Let sit for 5 minutes, or until all water is absorbed. Brown meat; drain off fat and return to skillet. Add pepper, garlic salt, tomato sauce and Worcestershire. Stir and simmer for 5 minutes. Mix together cottage cheese, sour cream and rice. Lightly spray a 9x9 casserole dish with cooking spray. Spread rice mixture in bottom of pan. Top with meat sauce. Sprinkle cheese on top of casserole and bake for 20-25 minutes. I'd love a TexMex spin on this with Mexican Crema for the sour cream and some pepper jack cheese. Great sounding dish! Worcestershire sauce does not agree with me at all. Would this recipe fail without it? It would be fine without it. Enjoy! I just have to say that I love your recipes along with your comments about them. I receive many recipe emails because I run a group for people with mental health problems and we cook here at least once a month. I just wanted to let you know how much we appreciate your hard work! Sounds yummy! I wonder if this could be adapted to the slow cooker?? This is actually really good! I stumbled across it when I was looking for a new ground beef/rice casserole recipe. I didn't have cottage cheese so put about 3 T of cream cheese in. I also wanted more veggies, so I added a half onion (sautéed) and some corn. The creamy rice base is really nice.